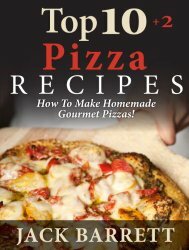 Check out this new free Kindle eBook Top 10 Pizza Recipes. You can download “Top 10 Pizza Recipes” for your Kindle from Amazon.com for free for a limited time! The cookbook details how to create your very own, homemade gourmet pizza with recipes and tips from chef Jack Barrett. Ebook reminder: This book was free at time of posting (September 24th, 2014) But, you should check the price before hitting the 1-Click button. You don’t need a Kindle device to read this book. You can download a free Kindle reading app to your PC, Mac, phone or tablet. You may also be able to read this book on your browser through the Kindle cloud service.